It is frustrating to be limited to petition-signing and letter writing. The Goliath of global capitalism seems unassailable, but for those of us protesting the coal train terminals here in our backyard, there was a flicker of success, even if it is only in the form of a delay in the process. So we mustn’t give up. When I shared (via social media) the following letter to President Obama in advance of his first-ever visit to Sweden, I expected a few signers, maybe a dozen. I was blown away by the response. Even if it never made it past some low-level functionary who tossed it into a vast NSA datafile, our actions give us courage. We must do what we can, wherever we can, never knowing which straw is the vital one. As you meet with Swedish Prime Minister Fredrik Reinfeldt next week, please know that the Sámi people in Sweden and North America are deeply opposed to the recent decision of Sweden’s Ministry of Enterprise, Energy and Communications that the national interest of mineral extraction is more important than the right of the Sámi people to keep its culture, including traditional reindeer husbandry. We join in the continuing protest of the illegal large-scale mining project in Gállok, Sábme (Lapland). By international law, including the United Nations Declaration on the Rights of Indigenous Peoples and the United Nations General Assembly Resolution Declaration on Principles of International Law Concerning Friendly Relations and Co-operation among States in accordance with the Charter of the United Nations, General Assembly Resolution 2625, Sweden is not maintaining friendly relations with the Sámi people, who have not given free, informed, or prior consent for mineral prospecting or mineral surveying. 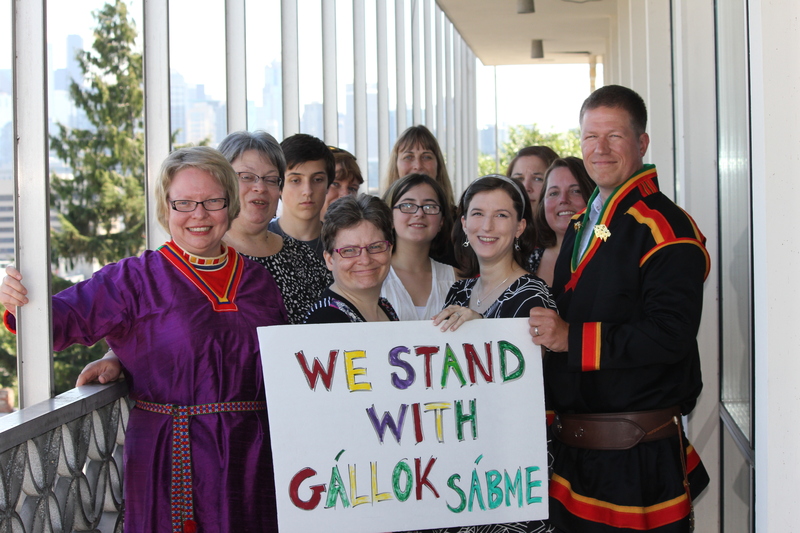 As Sámi and Sámi-Americans, we ask you to join us, the Sámi Parliament, and people all over the world in imploring Sweden to protect indigenous rights and the precarious health of our shared planet.